The Red-hot Pokers (Kniphofia) in my garden are in full bloom and I never noticed the baby Praying Mantis on this one until I up-loaded the photograph to my MAC. Upon closer inspection, I saw that many of the blooms had babies on them, Mother Praying Mantis has been busy! Praying mantises usually breed during the summer season and do not give birth but lay eggs that come out in a white froth. Each praying mantis egg case will hatch about 100-200 tiny mantises, all at once and when the babies hatch, they're entirely self-sufficient and on their own. The name Kniphofia is a tongue twister (pronounced nee-FOF-ee-a) but these plants are easy to grow. 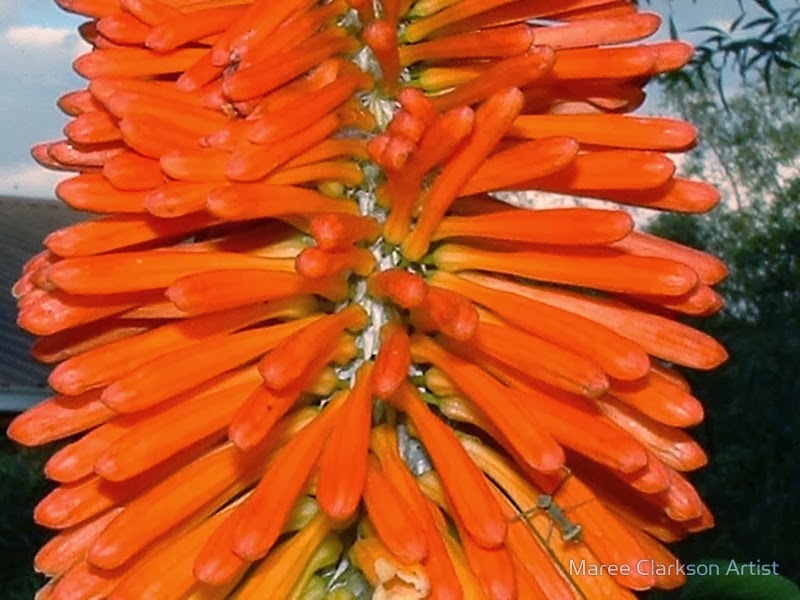 Once established, these Red Hot Poker plants can also manage drought, although mine tend to grow better and bloom more profusely with supplemental water. Full sun is a must as they get very scraggly and hardly flower at all in shade.